Starring – Rekha Thapa, Rajendra Khadgi, Ragini Khadgi, Pramod khadka, Bishnu Sapkota, Kishor chaudahry, Deepak Adhikari, Mukunda Shrestha etc. 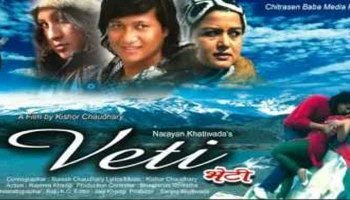 A movie by Narayan Khatiwada, ‘Bheti’ was released on November 2, 2012. Rekha Thapa role in this movie is said to be short but effective role. Ragini is featured with her dad Rajendra Khadgi in the movie. The screenplay and the story of the movie is written by the director Kishor Chaudhary.